I got this shoe back in August and I wanted to run it through the paces before I gave a review. I think overall Hi-Tec is a great company that makes some innovative footwear and blends different materials to offer a price point product with one or two great features. The Hi-Tec V-Lite Infinity shoe is a pretty good all around shoe. It has a Vibram sole, great breathability, and a new technology, Ion Mask. These are all good features and offered on a shoe that is $119.99 is pretty good, but I will run through this review with a few questions about this shoe and the overall feature set and function of the shoe. The first thing that strikes you with this shoe is that there is nothing special about it. Honestly. Sometimes you see a trail runner and you say, "Yes, I can see where the price tag comes from." Or, "Yeah, it says Gore-Tex or eVent and so the price is justified." With the V-Lite Infinity you don't get that feeling. There's no special lacing (more on that), skeleton frame, stabilizing system, etc. This isn't a bad thing, because this shoe actually brings it on the feature side of things, but it automatically puts the shoe at a disadvantage because there is no "wow" factor. This is in addition to the fact that the only "wow" factors on this shoe is a Vibram sole and Ion Mask technology, one you don't need and one no one knows about! No one really looks for a Vibram sole on a trail runner. It is a welcomed advantage and explains pricing, but Vibram really only comes into play on boots and technical footwear, not trail runners. By comparison I have two pairs of Salomon trail runners and Salomon never uses Vibram. Neither does La Sportiva or Scarpa, seriously. They may use Contagrip of Frixion, but never an expensive leading technology that really doesn't pertain to the function of the product. This puts the Infinity at a disadvantage because you now have to justify a price that is not comparable to the feature set. By comparison the Ion Mask technology that Hi-Tec uses on this shoe is great. There is basically an application of a fluoro carbon (monomer) that charges the outside of the shoe and makes it hydrophobic. It also resists dirt particles and other damaging debris. 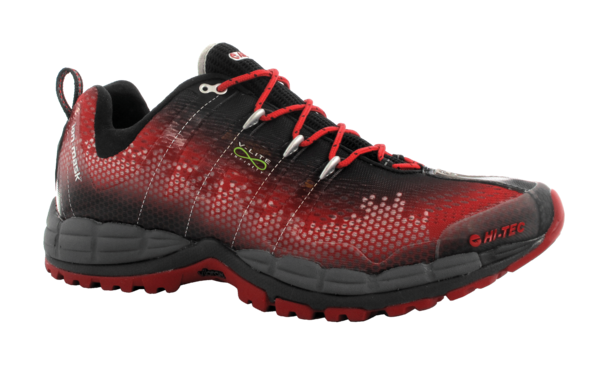 The lack of punch for the Infinity trail runners or lack of quality features, makes the shoe less desirable for most customers because you have to assume that Hi-Tec is making up for a lack of quality or function in their product. The technology that is present isn't present with any competitor and by comparison the others are doing quite well. This makes it extremely hard for the Infinity to compete with the likes of Crosslites from La Sportiva or XT Wings from Salomon. They also don't offer any real trail running function. By this I mean there is no aggressive tread, no stabilization technology, no special lacing system and no waterproof technology. For $119.99, you might as well spend another $10 and get something like the Salomon XT Wings. Speed Lacing, Skeleton Chassis, Ortholite footbed, etc. What it comes down to is a lack of features compared to competing product in regard to price. I would like to say otherwise, but honestly, I can't. This shoe is very comfortable, breathes incredibly well, and the Ion Mask also allows for a clean look and long lasting upper on the shoe, but the lacing, sole and the pricing are three points that Hi-Tec missed on...completely. Looks like you missed the flexibility of the outsole, quite opposite to stiff plate of LaSportiva. This may be either good or bad, however is trendy, since foot muscles get some extra workout in conditioning, the issue mentioned in Born to Run. If the trail is technical (and long),this may turn against the user. The Ion Mask protection is like a difference between waterproof and water resistant. Your feet will still get wet, esp. the protection is only partial. The esthetics of the shoe is outstanding, and when the Ion Mask could be blamed for failing to fully protect your feet (like Ice Bug), it certainly brings out the color like the clear coat on a car.Great eye candy for sure.